This week the SAPT interns will be gracing our blog post. First up is Nora Mady. Take it away Nora! As someone who is just entering the world of fire and rescue, I continue to learn new things on a daily basis, as I become more involved. I recently joined the Fairfax County Fire and Rescue Department in hopes of becoming an EMT and providing basic healthcare to satisfy graduate school requirements. However, within a month of being a new recruit, I had my eyes set on a different goal: I wanted to become a volunteer firefighter. One of the first steps the county requires in the firefighting qualification process is to complete a test called the CPAT (candidate physical ability test) It is an 8-event test that challenges the basic physical abilities and movements that a firefighter must perform should they encounter a fire or emergency situation. I distinctly remember someone telling me after I had passed CPAT, “Good job. Now keep working out and stay in shape. We don’t want you dislocating any shoulders in fire school.” Now, having already suffered a dislocated shoulder I began to worry. Did people who dislocated their shoulder just not move functionally? Or was the nature of fire school so brutal that only the lucky ones avoided injuries? I decided to do a bit of research on the topic and found that shoulder injuries are suffered by more firefighters than I originally thought. Now, you may think the upcoming advice won’t apply to you unless you’re a firefighter, right? The shoulder joint is the most unstable joint in the body, and people from all walks of life suffer shoulder injuries and pain for various reasons. Whether you are a firefighter, a first responder, a public safety officer, an athlete, or someone who just wants healthy strong shoulders, these exercises will help you profoundly. Strengthening the muscles of your shoulder girdle and rotator cuff will help stabilize the joint and maintain integrity of what?. When the larger muscles take over for quick, powerful movements (deltoid, pec major, latissimus dorsi, rhomboids, etc.) your stabilizing muscles do not activate efficiently or quickly. I wouldn’t say that, I would stay that they are “over powered” but they’re on. This pattern slowly weakens those muscles over time, and combined with the load that is applied to the joint, makes it easier for them to suffer injuries, pulls, and tears. While standing, and with no more than a 10-lb dumbbell in each hand (I use 4 or 5 pounds in each hand so that should tell you this is not the type of exercise to load up on) raise each arm out so that it is parallel to the ground and at 45 degree angles from your midline. Turn each hand laterally (to the outside)so that your thumbs are facing up and your palms are turned towards you. Slowly lower your arms down to your sides and raise them. Ensure that sure your hands are never higher than your shoulders. Do this for 20 reps (you can break them up into 2 sets of 10). This exercise isn’t supposed to exhaust you and shouldn’t be performed to failure. Your supraspinatus is a very tiny muscle that your prime movers can compensate for when you perform big heavy movements, so isolating it for rotator cuff strengthening purposes can be really helpful in injury prevention or for rehabilitation purposes. This guy is performing the exercise prone, on a stability ball, as a variation. External rotation (a movement at a joint that causes rotation or a limb or part of a limb around its long axis away from the midline of the body) is a movement that is generally a bit more vulnerable than other the shoulder movements . You can perform various exercises that elicit the same movement and work on your teres minor and your infraspinatus (the main external rotators of your shoulder). These exercises can be performed with bands as resistance, a cable pulley machine if you are at a recreational gym, or free weights, as you stand or lie on your side depending on your mode of resistance.Start with your upper arm aligned with your torso, your elbow bent at a 90 degree angle, and your forearm straight out in front of you. Now, with whatever means of resistance you chose to use (dumbbell, band, cable, etc.) internally rotate your forearm a bit so that it is closer to your midline. This will be your starting position, with your thumb facing upwards and the palms of your hands facing your midline. You should pull against the resistance away from your midline. Make sure that this exercise causes no pain, and if it does, stop immediately. You should feel a little burn because these tiny muscles can fatigue very easily. I would suggest sticking a towel between your ribs and your elbow so that you’re constantly aware of keeping it from falling, indirectly keeping your arm from deviating away from your midline.I would choose a weight or resistance level that allows you to perform 2-3 sets of 10 reps for each arm. Here are a couple of tips for the average gym-goer to protect their shoulders. Sometimes you need to give up looking really cool and tough in front of your friends at the gym so that you can be really cool and tough and pain free when it’s really important, like fighting fires and saving cats from trees. 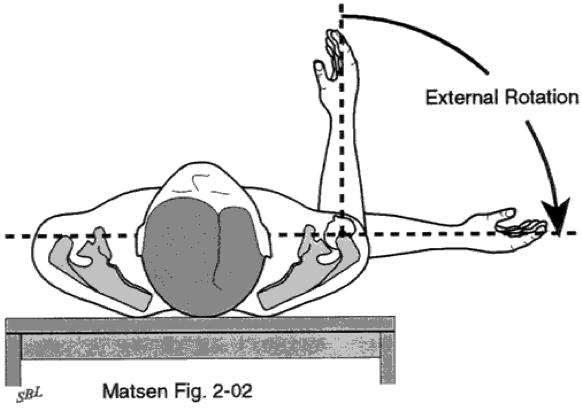 Lateral and front deltoid raises: just stop doing them, at least with your palms facing down. This creates a really tight subacromial space (a very tiny pocket between the top of your shoulder and the head of your humerus), and that’s bad. It’s where all of your rotator cuff tendons hang out, and when you compress that space, you irritate them. This is a common cause of a lot of shoulder pain and discomfort. If you must do these exercises, I would recommend turning your hands so that your thumbs face the ceiling. This opens up that subacromial space and gives those tendons a little more room to wiggle. They will be happier, and in turn, so will you. -Overhead exercises are great, but unless you are an Olympic weightlifterdoing super heavy overhead barbell work is killer on your shoulders, and not in a good way. A splendid alternative is using a dumbbell and performing overhead presses unilaterally (one side at a time). This will give your shoulders a chance to 1) not compensate for one another and 2) really engage those rotator cuff and stabilizing muscles when you have a single dumbbell overhead versus a huge barbell whose weight is distributed over a much bigger area. Still, be very careful with these and start out at a reasonable weight. Also, avoid twisting your hands during these (meaning don’t start out with your palms facing behind you and then end, fully extended, with them facing away from you). You sometimes do this with row variations, but when you are dealing with moving weight in the vertical range of motion, it can place a lot of pressure on your poor shoulders. It’s not nice, and it may feel fine at the moment, but over time your body will let you know that it is not happy with what you’ve been making it to. Stick with a single position (I prefer neutral). Another great alternative is the landmine press, which engages the same muscles as an overhead dumbbell press but whose stable axis provides your shoulder with a bit more stability than a free weight. Remember, if you have poor shoulder mobility to begin with, you shouldn’t bother or risk pressing anything overhead. -Rows are one of my favorite exercises. Landmine rows, seated cable rows, single arm dumbbell rows, I could go on. However, I see a lot of people mistake rows for big, fast, powerful lifts. Rows should be executed with elegance, grace, control, and proper breathing technique. A row that is done by essentially jerking the weight towards your ribcage and letting it fall back to its initial position without control is dangerous. When thee exercises are done too quickly, your don’t give your stabilizers enough time to react and contract to handle the stimulus or the weight. Mind you, this should apply to all exercises: if you can’t do a full set without compensating by jerking your whole body or making really weird faces, then your weight is probably too heavy. 1. Warm up your shoulders en-route to your call destination. 4. While swinging an axe, keep your dominant elbow closer to you and use your hips in delivering the force, rather than your back and shoulders. Remember to also use short, controlled chops. Big swings can result in missing your target, and missing your target can result the tearing of your rotator cuff. 5. Be safe and smart! Yes, you are in an emergency situation, but if you rush your movements and don’t perform them intelligently, you can hurt yourself, only escalating the severity of your situation.